Weighing up to 6000 kg (6.6 tons) and measuring up to 3.3 m (10 ft.) at the shoulder, the African elephant is the world’s largest land mammal. It is characterized by its highly dexterous trunk, long curved tusks, and massive ears. 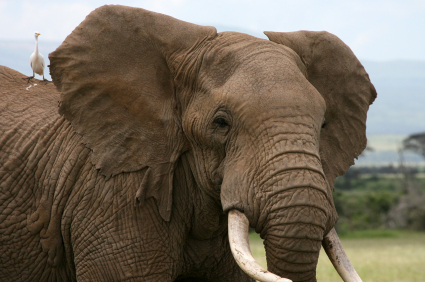 A combination of the upper lip and nose, an African elephant’s trunk is extremely versatile. Elephants use their trunk for smelling, breathing, detecting vibrations, caressing their young, sucking up water, and grasping objects. The tip of their trunk is comprised of two opposable extensions, or fingers, which allow for extreme dexterity. Both male and female elephants possess tusks, which are modified incisor teeth. Although tusks are present at birth, the “baby tusks” fall out after a year, and permanent ones replace them. These tusks will continue to grow throughout the elephant’s life. Similar to the trunk, elephant tusks are utilized in a wide range of activities. They are used for digging, foraging, and fighting. At times, they also act as a resting place for the elephant’s very heavy trunk. An African elephant’s large ears also serve many purposes. The ears’ large surface area helps radiate excess heat under the harsh African sun. The ears are also often used to communicate visually. Flapping their ears can signify either aggression or joy. And finally, elephants’ ears, used in conjunction with the soles of their feet and their trunk, aid in the ability to hear sounds over long distances. On average, an elephant can hear another elephant’s call at 4 km (2.5 mi.) away. Under ideal conditions, their range of hearing can be increased to 10 km (6.2 mi.). Although elephants can make a very wide range of sounds (10 octaves), they mostly communicate through low frequency sounds called “rumbling.” In fact, elephants are capable of producing and perceiving sounds one to two octaves lower than the human hearing limit. As lower frequency sounds travel farther than their higher counterparts, their range of communication is extensive. Furthermore, elephants have the ability to judge the distance from another elephant based on the pitch of his/her call. As the sound travels over distances, the higher tones will fade out, leaving a lower pitch. Communication is vital to elephants, who rely on a social network for survival. The sustaining social unit is a herd of mothers and their young, sisters, and female cousins, led by an older matriarch. Male elephants will leave the herd at around 14 years old when they hit puberty. They then join a loose-knit band of other bull elephants, leaving the bachelor herd at will to search for potential mates. Upon successful mating, the male elephant will move on to other herds, and the female will start a 22-month gestation period. When the calf is born, aunts, sisters, and cousins all help care for the newborn. In this way, all the elephants of the herd learn essential lessons in rearing a baby. And since elephants only give birth once every 5 years, successfully raising their offspring is critical to their survival. Aside from their ability to learn through watching and mimicking, African elephants also possess other very human qualities. Their great capacity for compassion is demonstrated as they care for the wounded and grieve the deceased. Their developed sense of memory allows them not only to remember lost loved ones, but also to harbor grudges, and recognize long-lost friends. Upon the return of a friend, elephants take part in a joyous greeting ceremony where they spin in circles, flap their ears, and trumpet. Having adapted to life across Africa’s diverse ecosystems, the African elephant plays a vital role in maintaining ecological harmony. African elephants ingest plants and fruits, walk for miles, and excrete the seeds in fertile dung piles. In this way, new plants can grow in different areas and can cross fertilize. In fact, 90 different tree species rely on the elephant for propagation. African elephants also dig holes to expose underground springs. This allows smaller animals to access water in drier times. As African elephants act as a keystone species, it is vital to take steps in their conservation. 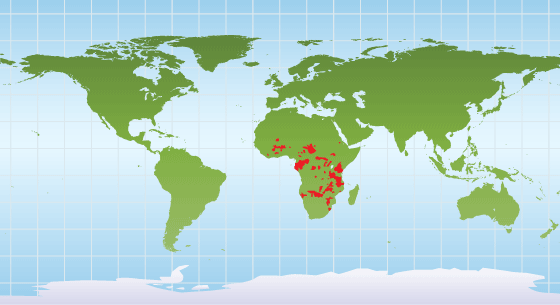 Poaching and urban sprawl pose a massive threat to their survival. As such, the African elephant is classified as a vulnerable species under IUCN’s Red List. There are several ways to help support African elephants. One way is to participate in eco-tourism. Boosting Africa’s economy through eco-tourism helps placate local residents who view elephants as pests. The illegal ivory trade has skyrocketed in recent years. Decreasing the demand for ivory is essential. Never buy, sell, or wear ivory. Write to your politicians to speak out against poaching. (Americans can write a letter to the Secretary of State on the Wildlife Conservation Society website.) For information on organizations that combat the illegal ivory trade, see National Geographic’s page, Blood Ivory: How to Help. 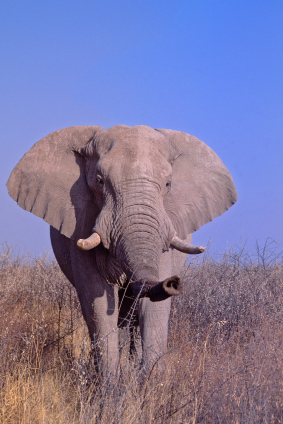 African elephants inhabit various ecosystems in sub-Saharan Africa.